Gold Fields would like to merge with its larger South African rival AngloGold Ashanti Ltd., as the industry experiences a wave of consolidation, according to a person familiar with the matter. Gold Fields believes it would be the ideal combination as the two miners operate in similar jurisdictions and have a shared philosophy, said the person, who asked not to be identified because the information is private. Discussions haven’t taken place yet, the person said. Gold Fields denied it is interested in combining with AngloGold, according to a statement issued to the Johannesburg Stock Exchange on Tuesday. If a merger happened, it would bring together two miners with a combined market value of about $8 billion. The enlarged company could produce almost 6 million ounces of gold a year, closing the gap on Newmont Mining Corp. and Barrick Gold Corp., which have both announced mega deals. Gold Fields shares climbed as much as 7.7 percent, and were trading 3.4 percent higher at 5:26 p.m. in Johannesburg. AngloGold rose 2.4 percent. “If you are going to survive in the long term, you are going to have to look at consolidation,” Gold Fields Chief Executive Officer Nick Holland said in a Jan. 15 interview. A tie-up would allow the two Johannesburg-based producers to repackage their troubled South African mines together for a potential sale should a buyer be found, the person said. It’s not the first time a combination of the two companies has been proposed. The Gold Fields CEO was reported in April 2010 to be open to consolidation with AngloGold, while the two miners also weighed a merger in September 2006. The new company might also sell or consolidate other assets, the person said. 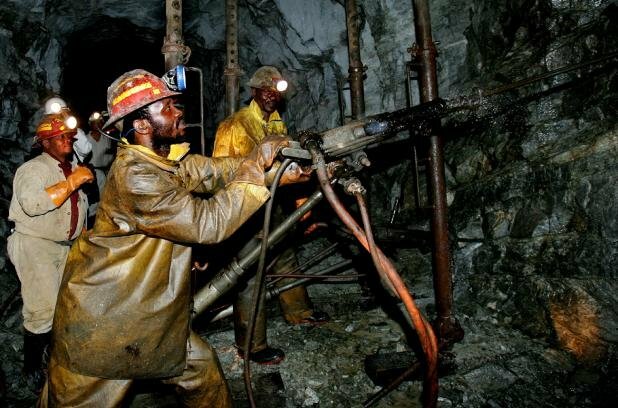 Gold Fields and AngloGold have mines close to each other in Australia, while in Ghana their adjacent operations could use a single processing plant, the person said. While a union with AngloGold is Gold Fields’ preference, it may also consider a deal with another top 10 producer, especially where that would lower costs, the person said. The need to turn around or sell its unprofitable South Deep mine would make that option more difficult. Still, Gold Fields’ Australian assets make it attractive as a potential takeover target, said James Bell, an analyst at RBC Capital Markets. AngloGold CEO Kelvin Dushnisky, who joined from Barrick last September, has said he may sell some assets at the No. 3 producer to focus on its lowest-cost mines. Bloomberg L.P. is a privately held financial software, data, and media company headquartered in Midtown Manhattan, New York City.